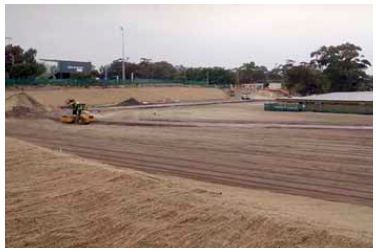 The Botany Car Park Waste Encapsulation (CPWE) Remediation Project is a shining example of how a large and complex remediation project can successfully be undertaken within a stone’s throw of a local community including a major shopping centre, athletics field, and residential and commercial premises. Thiess Services (Thiess) was engaged by Orica Australia Pty Ltd (Orica) to undertake the remediation of the CPWE, which was located at the Botany Industrial Park (BIP), Matraville, New South Wales. The project involved excavating and treating approximately 47,000 m3 of contaminated soil that was encapsulated in a synthetic liner underneath a car park on the BIP. The soil was contaminated with hexachlorobutadiene (HCBD) and low levels of hexachlorobenzene and hexachloroethane. The HCBD was a by-product from the former manufacturing of chlorinated solvents by Orica. The solvents were used for purposes such as dry cleaning fluid and refrigerants. Prior to 1979, these waste by-products were drummed and stored on open ground. Drum corrosion led to contamination of the underlying soil. 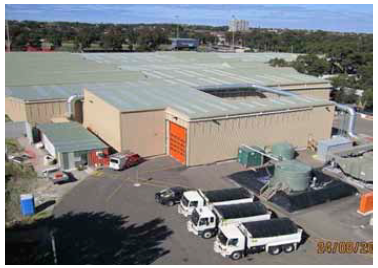 The CPWE had been constructed by Orica in 1980 to store the contaminated soil until a suitable remediation technology became available. Thiess was able to use Directly-heated Thermal Desorption (DTD) technology to treat the waste for Orica. The remediation of the CPWE was declared by the Minister for Planning as a ‘major project’ under the provisions of the Environmental Planning and Assessment Act (1979) and State Environmental Planning Policy (Major Projects) 2005. Thiess’ key objective for the remediation project was to remove the soil contamination associated with the CPWE to the extent practical and in accordance with the requirements of Orica’s Environment Protection Licence and Project Approval. DTD was selected as the preferred remediation technology for remediation of the CPWE. 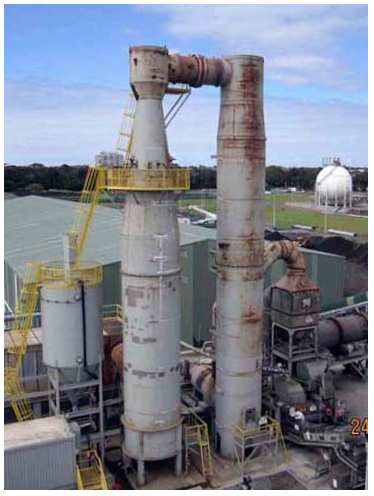 The DTD process utilises a destructive type gas stream treatment system. The off-gas that arises from the rotary dryer typically passes through a cyclone to remove dust before being routed to a thermal oxidiser, where contaminants are destroyed by combustion at around 1,000°C. Water mist is then introduced to the hot gas stream to rapidly cool the treated gas. The gas stream then passes through a baghouse, where fine dust is removed. An acid gas scrubber is the final step in the gas treatment system where products from combustion of the chlorinated contaminants are neutralised. To allow thermal treatment to be conducted, two soil buildings - the Excavation Soil Building and the Feed Soil Building - were designed and constructed to fully enclose the soil excavation and material screening/ pre-treatment areas, providing controlled working environments and preventing fugitive emissions. The Excavation Soil Building’s creation was the result of cumulative knowledge gained by Thiess over the past decade. The primary unique feature was the installation and relocation of the building’s internal walls and columns as the excavation progressed to maintain air volumes compatible with the capacity of the building’s Emission Control System. All air from inside each building was drawn into the respective Emission Control Systems where it passed through a series of particulate filters and granular activated carbon beds to remove particulates, odour and contaminants such as volatile organic compounds. The treated air was released externally through an EPA-licensed stack. The internal air quality was continually monitored to determine the level of Personal Protective Equipment required by operations personnel. Both the Excavation Soil Building and Feed Soil Building provided controlled remediation excavation environments which facilitated an environmental monitoring program to protect community and environmental health, as well as an occupational health and hygiene program to protect the health of workers. The contaminants within the soil were strongly odorous, with low acceptable exposure limits and soil emissions and vehicular gases were extensively monitored. The minimum level of Personal Protective Equipment required within the Excavation Soil Building was determined by a quantitative risk assessment that utilised occupational health and hygiene techniques. Workers were required to operate excavators and other plant inside the building using medical air that was supplied through a respirator. The excavators and plant were equipped with supplied air systems but ground personnel either used tanks carried on their backs or a compressor-fed air-line system. Trucks transporting contaminated soil from the Excavation Soil Building to the Feed Soil Building were fully sealed and passed through an automated wheel wash before exiting the building. The prevention of fugitive emissions to the external environment was assisted by the entry and exit of trucks through an airlock. The objective to protect the environment by remediating the CPWE area was achieved with complete destruction of contaminated materials through the DTD. Over 100 stockpiles of treated material were sampled and each one met the requirements of the Stockholm Convention. With less than 2 mg/kg of scheduled chemical wastes remaining, unrestricted re-use of materials on the client’s premises was allowed. Furthermore, the CPWE surfaces beneath the synthetic liner all passed the project validation criteria. 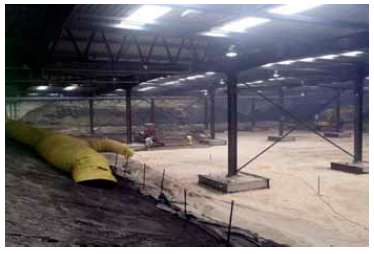 The combination and extent of the environmental and occupational health controls applied to this unique project, coupled with the design of the Excavation Soil Building was industry-leading. These controls significantly minimised risks and impacts to Thiess workers as well as community members living and working only metres away from site operations. This remarkable project was completed in late 2012. For more about Orica’s Car Park Waste clean-up, watch the 9-minute film, Pass The Baton. You can also go to earthfoundationaustralia.org which provides information about the legacy of the Year 2000 “green games’ including Oral Histories and and a Case Study that looks at the Rhodes Peninsula and Orica’s Car Park waste remediation projects.